Wolves now roam the snow biome along with the antelopes. Wolves will stalk you if they sense you from a distance. If you get too close they will charge and attack. Be prepared with arrows or a spear. A knife, hatchet or hammer will do, but you should be well-armoured before trying. Wolf meat and pelt can be harvested from their carcass with a knife. Their meat offers similar benefit to venison when cooked. The pelt will be used to make warm clothing in the future. For now it makes a nice rug. Respawn timers on all wildlife have been increased. It now takes longer for wildlife to return to an area where they have been killed. Wildlife will not respawn if you are in their spawn proximity. If you find that certain wildlife is not respawning, leave the area (approximately a few hundred yards) to let the wildlife “return” to the area. This prevents dangerous wildlife from spawning on top of your head, keeps wildlife from “popping” into existence too much and breaking immersion, allows you to temporarily “clear” an area for safety, and makes it a little more difficult to hunt since wildlife usually will avoid inhabited areas. There is still a chance that wildlife will roam into an area you have settled from a distance. Empty water gourds can now be filled in the snow biome at a fire by melting snow. Simply stand by a fire within the snow biome and choose “fill” from the drop down menu on the empty water gourd in your inventory or double click on the empty water gourd. Bridges, climbing paths, buildings, wells, plants and various pickup items have been added to the landscape. This will be a continuing process as the landscape is populated with more assets during each update. Wildlife spawn locations, particularly in the desert and volcano biome have been increased. Thanks for playing Windstone! Please leave feedback if you find bugs or have suggestions. Windstone is still very much in alpha development and will undergo many changes. Your help and support is greatly appreciated. Originally posted @ itch.io which is also were you can download the game. After the first couple weeks of open alpha testing it has become apparent that Windstone is very resource intensive and needs to be optimized greatly. Windstone loads fast and runs great on most high end PCs but some testers must lower their settings drastically or can’t even load the game. This is mostly due to the world of Windstone being enormous and completely seamless. 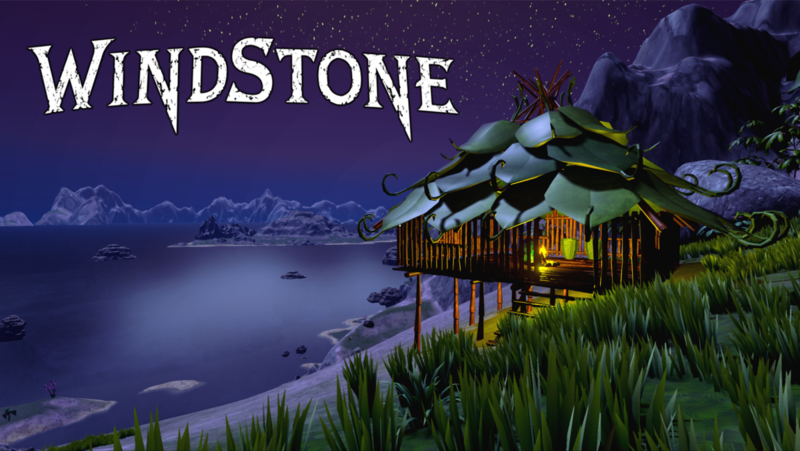 In an effort to drastically reduce the minimum requirements of Windstone many assets and the landscape are going through a complete overhaul. The overall poly count is being reduced by many hundreds of millions and the landscape itself is going to be slightly decreased in size. This is almost complete and the update should be live for testing in a few days. These optimizations have been done in a way that is almost entirely visually unnoticeable. Much care has been taken to reduce the poly count of assets without changing their appearance. If all goes well, Windstone should appear almost exactly the same visually but load faster and run at a higher frame rate. After the next update goes live, subsequent testing will determine whether development can continue as planned or require even more drastic optimizations. The development vision for Windstone is to keep the world as large as possible and seamless which pushes the limits of the UE4 engine in many ways. Head over to Itch.io to get the latest version. Change notes can be found here or here. If you encounter any bugs or other issues with the game, please report them in the forum either here or on itch.io.